To start off this tutorial, grab my LOVE Template HERE. The kit is called "Love Letters" and made by AW Design and can be bought HERE. The mask is Rose's Grunge Mask 2 which you can download from Creative Misfits. And I made a special wordart for this, just right click it and save. 1. Open up the Mask and choose COLORS>INVERT then LAYER>TRANSPARENCY>COLOR TO ALPHA. Resize to 690 x 595. Duplicate the layer and flip the copy. Go to COLOR>INVERT and then FILTERS>NOISE>RGB and the settings at 20/20/20/0. Click OK. Move the masks to the bottom layer. 2. Right click on the pinkboxfront layer in template and choose Alpha to Selection, then FILE>OPEN AS LAYERS the Love Paper 6. LAYER>TRANSPARENCY>ADD ALPHA CHANNEL and then resize by LAYER>SCALE LAYER to 500 x 500. Click SELECT>INVERT and make sure you are on the Paper layer then EDIT>CLEAR. The paper should be exactly the same size as the pinkboxfront layer in template. Delete that template layer. 3. Repeat step 2 but with the whitefront circle layer of the template and use Love Paper 1. 4. Open as layers the Love Sprinkes. Resize to 205 x 285. Then right click and choose Alpha to Selection and then to SELECT>GROW by 2 and then add a new transparent layer. Place this new layer below the Love Sprinkles and choose the bucket fill tool. I used a light grew color to fill. Next, go to FILTERS>NOISE>RGB and hit OK. Move these 2 layers under the pinkfrontcircle layer of the template. 5. Open as layers the Love Brush. Resize to 475 x 545. Move this layer above the Love Sprinkes and below the pinkfrontcircle. 6. Open the wordart I made and place it in the lower right corner. Then open the Love Heart and resize to 174 x 150. Place it around the wordart. Keep these layers above the Love Sprinkes also. 7. Open the Leah 3 tube and move it in place above the pinkbackcircle. Right click that layer of template and choose Alpha to Selection then SELECT>INVERT and make sure you are on the tube layer and EDIT>CLEAR. Set transparency by moving the slider above the layers box to 45. Open the Leah 2 tube and flip it then repeat the steps above but with the Love Paper 1 layer. Open the Leah 1 tube and resize her to 220 x 583. Place her in the appropriate place. 8. Open as layers the Love Frame and resize to 515 x 520. Move this layer below the pinkbox2 layer of the template. 9. Open as layers the Love Card and resize to 170 x 105. Place it in the appropriate area. 10. 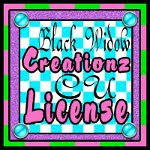 I added drop shadows to the following layers: Leah 1, Love Card, Love wordart, pinkfrontcircle & pinkbox2front. To do this, go to FILTERS> LIGHT AND SHADOW> DROP SHADOW and change the settings to 4/4/9. 11. Make your text with your choice of font and place it in the Love Card. I used Vladimir Script. 12. DO NOT FORGET TO ADD COPYRIGHT INFO TO YOUR TAG! 13. Use the rectangle select tool to crop the final product and go to LAYER>CROP TO SELECTION. Save your work. Hope you enjoyed this tutorial! I'd love to see your take on it! You can send it to me HERE!